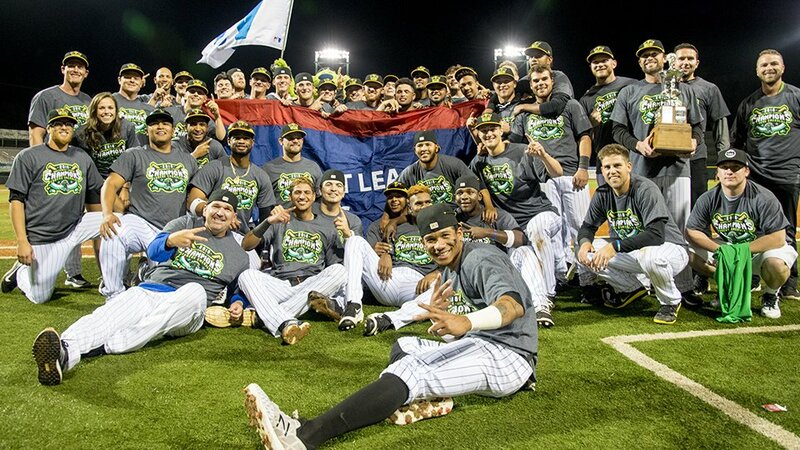 I am still finding it hard to believe that Eugene won the Northwest League title. I know they did it because I watched them do it. This was a team that had to overcome the roughest of starts to a season I’ve seen in a while. The first three weeks of the season were not good. They were last in the league in hitting. However, they improved greatly in July. This year‘s draft class and two non-drafted free agents solidified the defense in the infield and behind the plate and lengthened the lineup. They also added some depth to the starting pitching from the draft and later the Emeralds got some relief help from Mesa. I will have more on the Ems remarkable season in a couple of weeks when I do the affiliate reviews of the 2018 season. 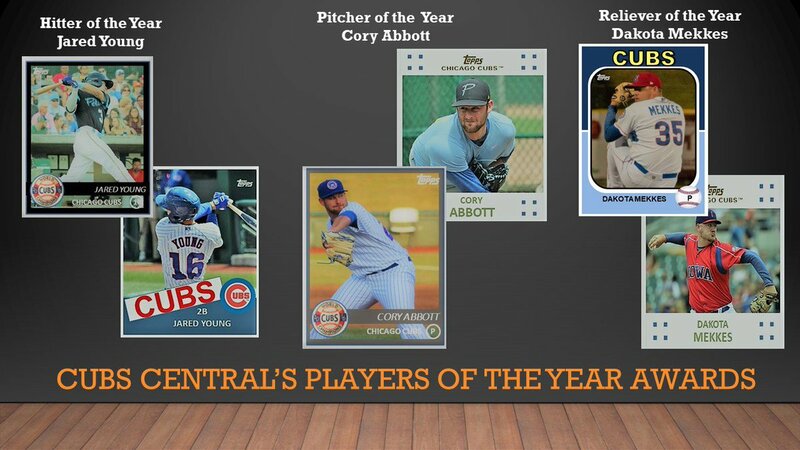 This year’s “Cubs Central’s Player of the Year” awards are pretty straightforward. Infielder Jared Young won his award for “Hitter of the Year” through a combination of an excellent approach and his bat to ball skills. He did so at South Bend where he dominated with a wRC+ of 150 and again at Myrtle Beach where he secured himself a spot on Tennessee’s roster for next year. For the season he hit .300 with 16 home runs, 76 RBI. While “Pitcher of the Year” Cory Abbott can get his fastball up into the mid 90s on occasion, he has an excellent slider and he misses a lot of bats. I think what gets under sold on him is his makeup. He is fierce on the mound and he might be the most competitive arm in the system. He had a 2.50 ERA with 131 strikeouts in 115 innings as well only walking 39 on the season between South Bend and Myrtle Beach. He should begin 2019 at Tennessee at the age of 23. By the beginning of next summer, “Reliever of the Year” Dakota Mekkes should be pitching out of the bullpen in Chicago 3 days a week. The 6‘7“ deceptive right-hander began the year just dominating AA with a 0.81 ERA in 22.1 innings. When he began June at AAA Iowa, he had some adjusting to do, but he started to figure things out in short order. Between the two affiliates, he had a 1.17 ERA and 71 Ks in 53.2 innings. His walk rate improved from 5.24/9 in Tennessee to 4.60/9 in Iowa which is probably the only thing holding him back from getting the September call up. Only 2 Cubs prospects made Baseball America’s post-season all-star teams by levels (not leagues). In the Dominican, Pitcher Luis Rodriguez made it with a 0.73 ERA and South Bend closer Brian Glowicki made it at low A. Congrats! No news is coming out of Tennessee about the Cubs and the Smokies extending their professional development contract beyond this season. It’s starting to get late in terms of announcing a deal. Hopefully one will come this week. Yu Darvish had a procedure called a debridement done in Texas this week. It basically cleaned up his elbow without doing Tommy John Surgery. As a result, Darvish could return in 2019 at the beginning of the season. Starting tomorrow, the off season posts begin with the “Breakouts of the Second Half” series. There will be three articles this week on some guys who stepped up their game in the second half of the minor league season. Hitters kick it off on Monday, followed by starting pitchers and relievers later in the week. Also, the baseball cards just keep coming this month. 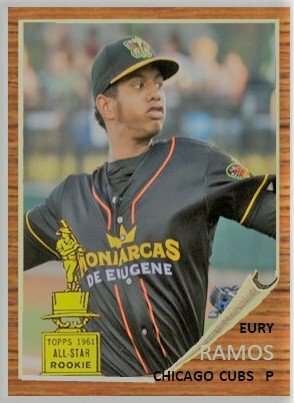 I will have more this week of Eugene players from the NWL championship. Here is this month’s album of cards. For the year, since spring training, there are over 800 cards made this year…my most ever! I need to get out some more.